Narmo International Inc. provides strategic consulting services and business products for governments, businesses, and consumers. 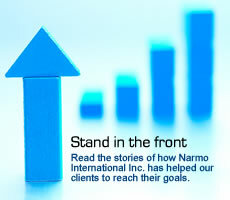 Narmo believes in constant innovation to help clients maintain competitive advantage in a dynamic world. Our organization strongly believes in a solution-centric consulting method to produce positive results for your organization, and not simply mundane reports and analysis. Narmo's motto "We Grow with you" reinforces Narmo's commitment to the highest standards of corporate integrity, customer service, and genuine growth. This commitment propels our clients to achieve unprecedented results in their respective fields. We invite you to explore our products and services, hear testimonials of real life clients like yourself, and see if Narmo, or one of its subsidiaries, can provide the solution you have been searching for to take your organization to the next level! Check out delicious Thrive Freeze Dried Foods. Available in stock and now in Canada. © 2005 Narmo International Inc.